Clubhouse with bar, lounge, dining facilities and changing rooms. Pro shop with club, trolley and buggy hire. 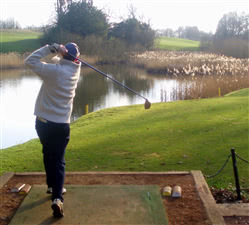 The course provides a challenge for golfers of all standards and is situated in the beautiful Surrey countryside providing an ideal location for a round of golf with many mature trees and water hazards. Milford GC is a par 69/par 68 parkland style course near Godalming, Surrey. The course is part of the Crown Golf portfolio of courses. A proprietary style pay and pay club with a playing membership. The course is a par 68 5,521 yards from the forward Yellow tees. it opended in 1993 and is a Peter Alliss & Clive Clark design. There are 5 par 3s, 12 par 4s and 1 par 5. The additional par 5 applies to the White tees. The course is currently bounded by the railway and 3 holes are currently across the adjacent main road, ie the 9th, 10th and 11th. However, the land upon which holes 9 to 11 has been sold and work is currently underway to reconfigure the course to include 3 new holes. The modified course layout is expected to be in place next September 2019. The club professional comments that he expects the new layout to be a big improvement to the current layout. I look forward to playing the new layout in due course! To accommodate the course modification works in progress, holes 5 - 16 have been renumbered holes 6 - 17, hole 17 is temporarily OOU and and a temporary short par 3 5th hole is now in use using temporary mats for tees. A minor inconvenience while the development takes place! The weather was awful at times but the course was a pleasure to play. Many of the par 4s are long and difficult challenges, eg the 1st, 3rd, 6th, 11th, 12th and 14th. The par 3 7th, 9th, 13th and 16th are very challenging par 3s. In conclusion, the tee shot on the par 5 18th hole is by far the most daunting for us medium hitters, involving a choice of three possible driving lines/options; is a shorter carry through a gap over the lake, a carry over a bank of high trees or a longer carry over another gap to the right of the trees. For the fun of it I chose the more difficult option and only just made the carry in winter cold/wet air conditions. When discussing my game at Milford with the Cherry Lodge club professional he remarked instantly that the 18th tee shot was the most challenging on the course! The 'off season' visitor green fee was £20. Good vfm! The staff at the course were very helpful. I enjoyed an excellent pre-game breakfast bacon and eggs muffin. Post match catering was limited to a toasted sandwich, due to catering staff being engaged servicing a function (ie a wake). Not a good scenario given that we had finished ahead of the usual kitchen closing time! I look forward to an opportunity to play the course again next year, preferably under dry conditions, and again thereafter when the modified course comes into play. Milford GC is a fairly young course (part of Crown Golf group), a few miles from Guildford. It was designed by Peter Alliss and Clive Clark on "Secret Orchards" (whatever they are). There is a sense of openness sending good vibes. The course is not too long (perfect for me), it is being redesigned at the present time but the length will be the same I believe. The land on which the 3 holes over the road (9th, 10th, 11th) are situated has been sold for housing development. One new hole 5th Par 3 is already in play (it replaces the 17th, same length). The other three are under construction. A £2 course planner will show the old holes and can be used as follows: 5th is 6, 6th is 7, 7th is 8 etc..... if that makes sense, the 17th exists no more and the 18th is actually the 18th... a wonderful hole, over a large expanse of water and uphill, dog legged a bit, that is from the White or Yellow tees, a little easier from the RED as in a different location. The general view is pleasant, open, varied, dog legs, slight inclines, little mounds here and there, lots of bunkers but funny enough I did not visit any, (well I had my fair share last Friday at Hampton Court Palace, I visited 8 of them and got out very well too, yes it is true). The fairways were very playable despite some mud sticking to one's golf shoes (all you need is to carry a brush "et voila"...) The greens were quite firm and interesting, I did miss a few putts but sunk some terrific ones with my lovely darling putter. The are a few holes with great water hazards, lots of wildlife, ducks, geese, swans and many pheasants making themselves heard. A few holes are bordered by the train line (Waterloo to wherever), one must not play when whilst trains are passing, there is a local rule of 2 penalty points if one does.... so you need to keep your wits about. I believe this is from a safety point of view, it does make sense. How would you like to read the wonderful exciting novel whilst travelling on South West Trains and suddenly get hit by a golf ball? That will do for the golf course for now. Easy to find with the SAtnav, big car park, Members & Visitors, welcoming and very well stocked Proshop (Ladies & Men), nice changing rooms, very pleasant, airy and light, open plan Clubhouse, friendly staff, nice seating area outside overlooking the Practice Tiered Putting Green and the 1st Tee. The food is reasonably price with the standard Crown Golf menu to chose from or the Specials on the day. A very nice 4 balls, thanks to the Crown golf "Masters" Peter W., bandit John B. and charming Chris K. returning to TSG after a short absence (may be he was recovering from last year's TSG final Matchplay against Andy A. (Chris: that new Putter is truly great, and by the way and dont forget to use those very "special tees". I think you had your A+ game today, Well done. Overall a lovely experience thank you all. Course highly recommended, you will be sure of a warm & friendly welcome. 8 am tee off, no one around, as above. Course in good condition, greens very true and in v good nick if a little slow due to morning dew. Bunkers could do with some work on ie raking otherwise interesting course with doglegs and water to make it a challenge. Ok, i am not sure. Need to go back again and then will review properly.